The topic of non-toxic and safe household cleaning is very important to me! I went into some good detail HERE about the types of dangers that lurk within many conventional chemical cleaners, and I even gave a few simple vinegar-based cleaning recipes that can be whipped up in a pinch. But what about green/non-toxic cleaners that we can BUY? As we approach a new year and begin to consider healthy changes we can commit to (and actually stick with), I am aware that not everyone is up for the task of diy-ing their household cleaners or dealing with the scent of vinegar for the long haul. I get it though, shopping for “natural” products in a store can be extremely difficult with their tricky (and sometimes less-than-upfront) labels. 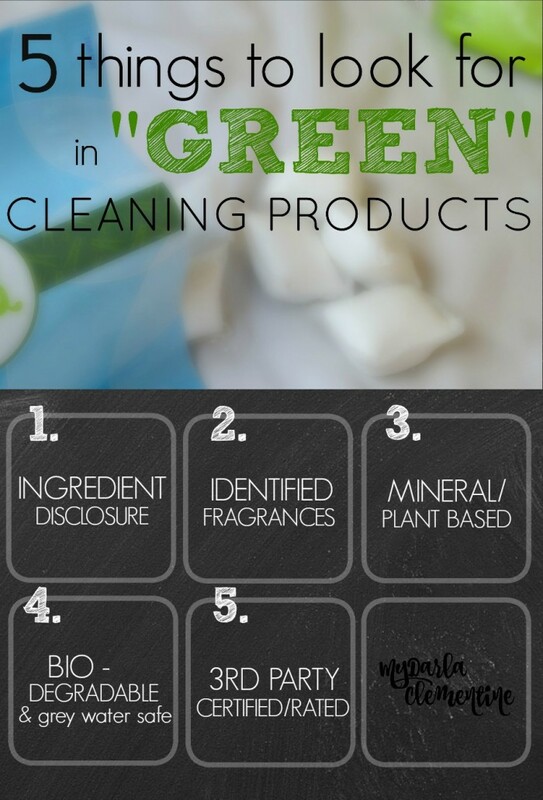 So,let’s go over 5 basic things you might want to look for while searching your local shop for “green” cleaners. Identified Fragrances: More than 95% of synthetic fragrances are derived from petrochemicals, and over 75% of products with “fragrance” contain phthalates. These are associated with hormone disruption, cancer, diabetes, obesity, autism, adhd… Let’s just say that knowing where our fragrances come from is a pretty big deal. Third-Party Certifications & Ratings: Certifications like EcoLogo, GreenSeal, or EPA’s Safer Choice Label will help ensure thorough testing on the product’s ability to work well, disclose and maintain high-standard ingredients, and be considered safe for people and the environment. The Environmental Working Group also has an amazing website that rates all kinds of products (from cleaners to makeup) and analyses the ingredients for their safety. They even have a smart phone app that enables you to check on a product’s toxicity while shopping! Now that we’ve gone through a few pointers, let’s take a look specifically at a few GrabGreen products. The following commentary will be based on my personal experiences with these specific products. I have not sampled or researched any of the company’s other products or ingredients. I will not be financially compensated for this review; you can trust that all information comes from the heart! Believe it or not, I had never used any type of pods before, and I found them to be SO CONVENIENT!!!! It may sound silly, but there is something incredibly satisfying about just grabbing a pod and tossing it in the laundry/dishwasher slot and not having to measure out product or carry around/put the bottle of cleaner away (especially since we don’t have a washing machine here in our apartment unit). I used the Bleach Alternative pods to soak soiled clothes before washing them many times, and again it was nice to just throw a pod into a bucket of water and not have to deal with any mess or measuring. 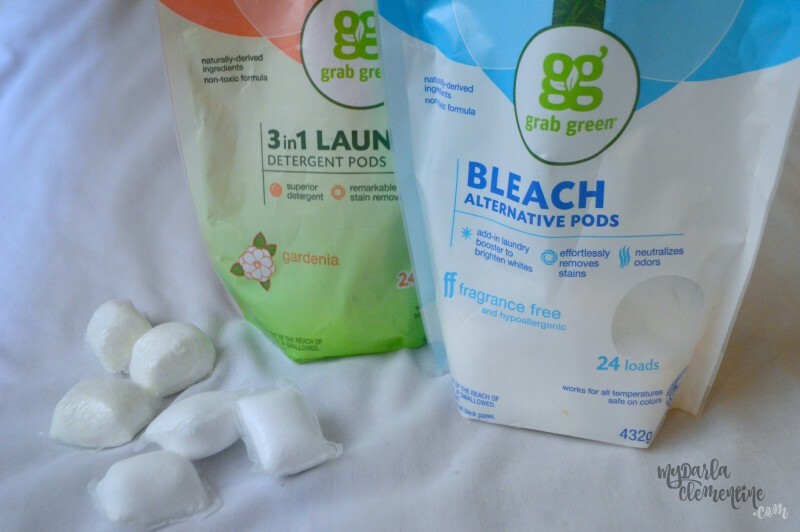 FUN FACT: GrabGreen created their pod concept even before Tide did! 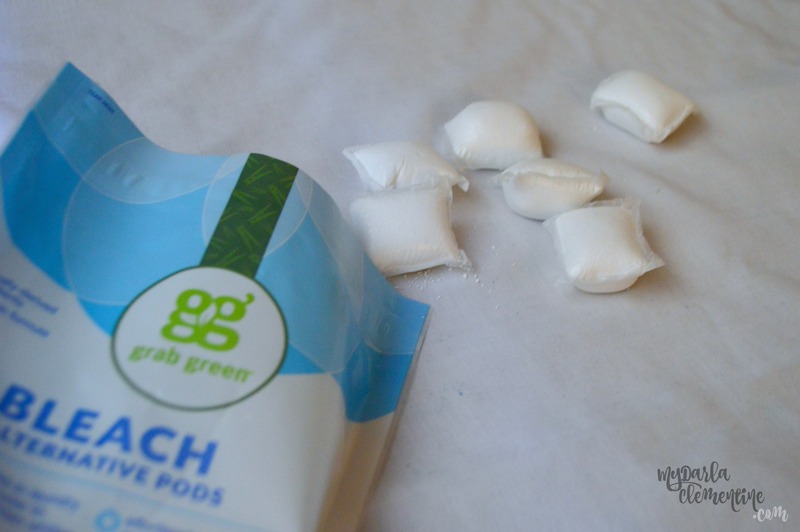 The dishwasher pods worked extremely well – I would say notably better than natural liquid detergents we had been previously using. The laundry detergent pods also performed highly. 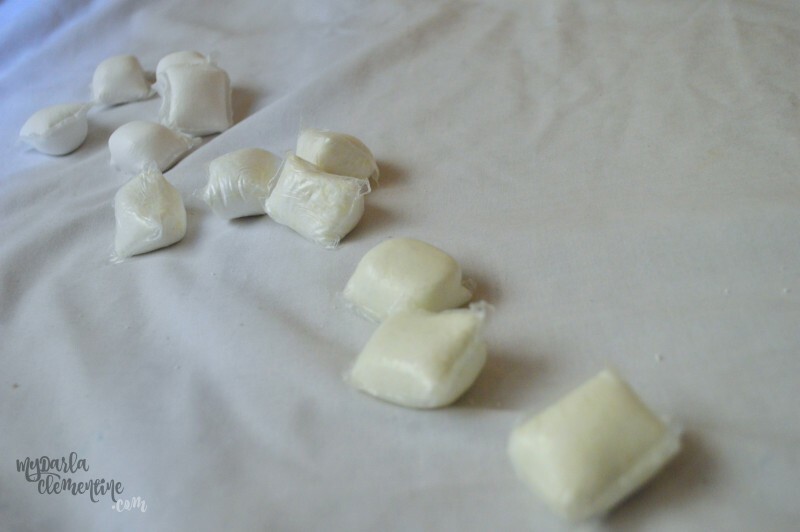 I felt comfortable using them on cloth diapers, delicates, and day-to-day clothes alike. The bleach alternative pods were really nice for throwing into a wash as an added booster, or helped brighten clothes when pre-soaked in the pod and water. Were they very effective at removing stains though? Some stains, yes, but definitely not all (or even most) of what I was encountering with my 1- and 2-year-olds. I found myself still relying heavily on my homemade stain remover spray. First off, I’d like to mention that GrabGreen discloses ALL of their ingredients on the packaging (which checks #2 off of our list above). 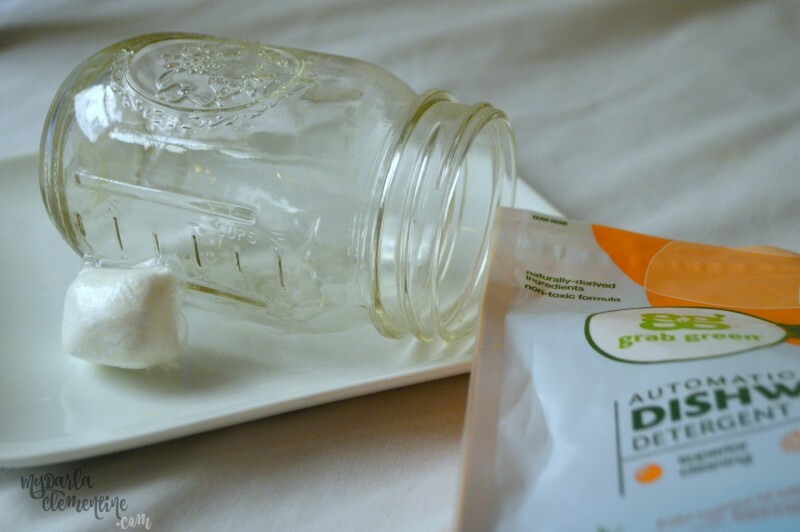 I personally felt comfortable with the ingredients used in the fragrance free samples of all three products (naturally derived, #3), and the EWG seemed to agree, giving them each an “A” rating (checks off #5). The one caution I did have, though, would be the fragrances found in the Gardenia laundry pods and Tangerine/Lemongrass dishwashing pods that I used. Well, you know that I am a fan of upcycling and reducing waste, and I do believe that their scents are “safe” if properly used (#2 above). Do I wish they used all natural or organic essential oils through and through? Sure! Could I tell a difference? Truth be told, after avoiding synthetic fragrances for so long I did find these ones to smell somewhat overpowering and artificial. I would personally prefer to use their fragrance-free options (…especially for the dishwasher detergent – I had a hard time adjusting to orange-scented dishes!). GrabGreen is readily available from their online store, Amazon Prime, and Kroger stores. 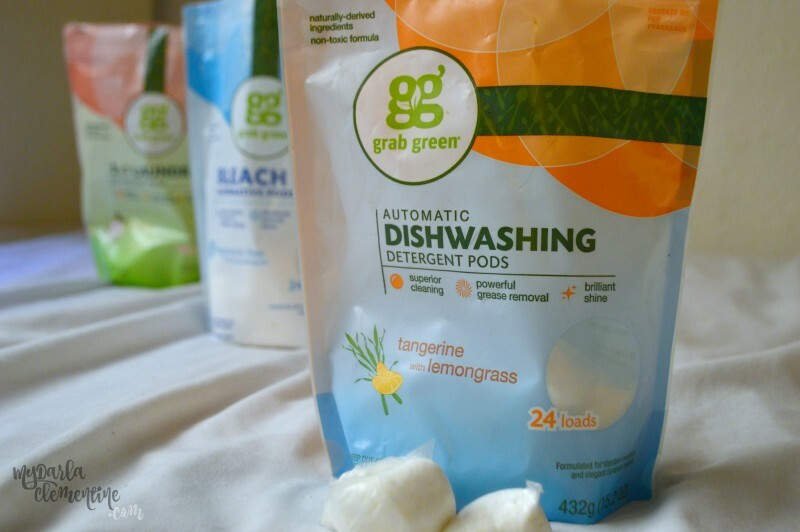 I would certainly buy and use GrabGreen’s fragrance free laundry & dishwasher pods! Their convenience is fantastic and they work well. Though the bleach-alternative pods are much handier than my go-to natural stain remover recipe, I haven’t found them to be quite as effective. With that in mind, I’d probably buy them every once in a while for an extra boost, but keep diy-ing my every-day spot treatments. GrabGreen is offering our readers a chance to win a $35 gift card and free shipping to try out whatever products you might be interested in from their store! No purchase necessary. Participants must be 18+ years of age and reside in the United States. Entries will be accepted until Tues, Jan 11 at 11:59pm PST. Winner will be contacted by email the following day. GrabGreen will be responsible for fulfilling winnings. // Affiliate links have been used in this post.